2 ready-to-use graham cracker pie crusts. But if you want to make it from scratch, you can see my recipe for graham cracker pie crust. 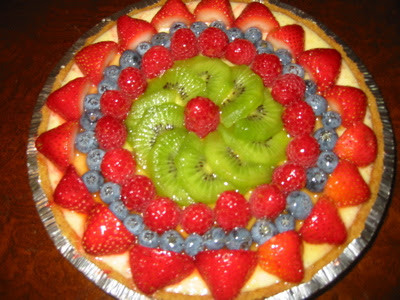 Fresh strawberries, raspberries, blueberries, kiwis. See my recipe for glaze. Use whipped cream for extra flavor. Wrap the outside of a 9-inch diameter springform pan tightly with 3 layers of heavy-duty foil. Unwrap the ready to use crust and put it inside the springform pan. In a bowl, beat the cream cheese, mascarpone cheese, and sugar with an electric mixer. Add the lemon juice and vanilla. Add the eggs, 1 at a time. Beat until well blended but not to much. Pour the cheese mixture over the each crust in the springform. Place the each springform pan in a roasting pan. Pour hot water into the roasting pan to come halfway up the sides of the springform pan. Bake until the center of the two cheesecakes moves slightly when the springform is gently shaken, about 40 to 45 minutes. Transfer the cake to a rack until it is cool, about 1 hour. Refrigerate over night until the cheesecake is cold. Halve some the strawberries and arrange around the edge of the cake. For the next circle, use the blueberries. Add another circle of kiwi slices. Fill in any spaces with blueberries. 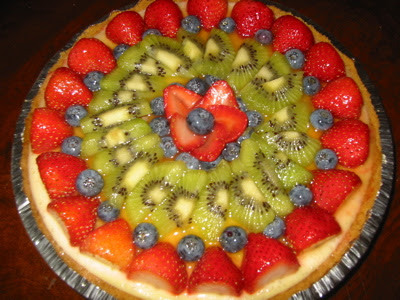 In the center of the cake, make a flower shape using strawberries slices. Finally, put a blueberry in the center of the strawberry flower. With a pastry brush, glaze the entire cheesecakes toping. Have fun and be creative with the design. Keep the cheese cakes in the refrigerator. Slice into 8 to 12 wedges and serve with a dollop of whipped cream.